I read a sci-fi book maybe 15 years ago I can't find. It was older, from the 90's or 80's. It was about some people who were very good at RPG fantasy games or video games and were asked by this rich businessman to test out a virtual reality computer program his company made. The computer was an AI and had each of the players go in and asked them all about their lives, etc. to get to know them and better design the game. Eventually it is ready and they go in. The CEO also goes in with them. He plays a rogue. They all have special abilities. The others play a warrior who could use any weapon expertly (even ones he's never used before), a guy who could heal people, a woman who uses a knife to cut shadows in reality and travels through them I think, and another woman who was married to the warrior who maybe could find things? I can't remember much of the world except bad guys on demon horses that were black with scales. After a while there is a weird thunderstorm in the real world that causes a ball lightning that floats into the building and hits the computer. The AI malfunctions and the players get stuck inside and it becomes dangerous. The CEO is eventually killed. I think some tentacle thing squeezes him to death? At one point they are in an inn at night and one person gets hurt and the healer guy runs in naked to heal them. Somehow they get out at the end but they find that they still have their powers in the real world. I've looked for this book online but can't find it. Hopefully somebody else knows it? 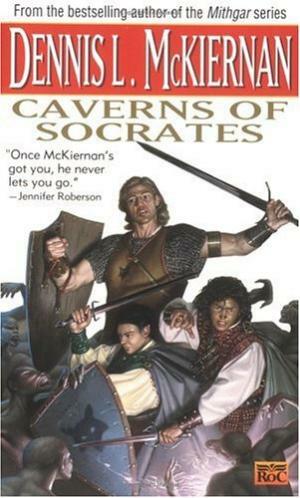 Some Google-Fu led me to the book Caverns of Socrates by Dennis L. McKiernan, published in 1995. I've never read it, but it seems to match.